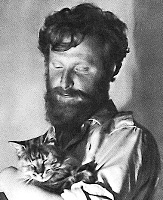 A homage to Ken Townsend's life and	works. 3 Oct 11: A new version of the Tiger tile, that is presumed to be an earlier design. 26 Aug 11: Plenty of activity on eBay has seen the price of tiles soar. A price of £191 for the Whale tile has set a new record. 1 May 10: A new Weatherby dish has surfaced with the sad Lion featured. 24-April 10: Finally! All the Horoscope tiles have been identified and can now be viewed! 15 Feb 10: New find! A circular tile depicting a Norman soldier, which matches the square tile found before. Our grateful thanks go to Heather Townsend and her sons. Also to Jim Bishop whose extensive collection helped greatly in the research of this site. This site is non-profit making and information is freely given – a link back would therefore be appreciated if you use information from this site. Information on this site is copyright © (see foot of any page). If you would like to use any text, please just acknowledge this site with a link. To use an image, then please contact us. Kenneth Townsend (1931-99) managed to capture the	humorous	side of life through his art, drawings and	writing. He was based in Hastings and is known to have worked	as a freelance designer for Hornsea Pottery, Chance Brothers (glass), Cuckoobird Productions (textiles) Merit (games) and	James	Galt &	Co. Ltd (toys). He was also the art director for Pickpocket	Books from	1991-1998. 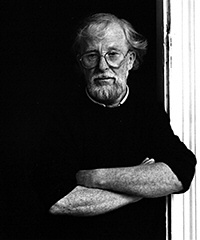 He exhibited his abstract art both at home and abroad and is represented in public collections in England, Scotland and Holland. He is the late brother of Dennis Townsend of Iden Pottery in Rye. His cartoons are certainly endearing, whimsical and unforgettable. They are mostly found decorating standard 6in. (15cm) white ceramic tiles, for which there are well over 30 known designs. Perhaps his most recognizable is the animal series 'Menagerie', which	adorned	ceramic tiles. There are believed to be 26 different designs. A different style also appeared on his tiles featuring the 12 horoscope signs. Another popular series was the Scenes of London, which was also adopted by Chance Brothers (below). The same style is seen in the Scenes of London slumped glass trays produced by Chance Brothers, in Smethwick, Birmingham. 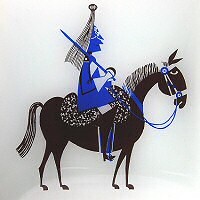 These were produced in 1972 and came as a set of six, plus a	lone	one	featuring	a	Scottish	Piper (1973) and a rarely	seen Shakespeare series (1974). This range extended further the figures seen only on Ken's independantly produced tiles. Another firm which adopted some of the Menagerie series was	Weatherby	Pottery and these can be seen on small dishes and mugs. 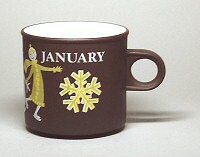 His other notable work includes the Love Mug series for Hornsea Pottery in	1976 (see right). Ken was also a very productive illustrator for children's books. In particular his own book, Felix the Bald-headed Lion proved immensely popular and was chosen as an outstanding book for	the	Junior	Literary Guild in USA. 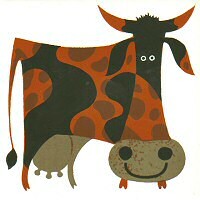 Illustrated (right) is an example from one book, Tootoo's Friends on the Farm, written by Warren Chetham-Strode. In conjunction with Cuckoobird Productions Ltd. Ken produced some stunning textile designs, based on the cartoon animals. Besides the Lion King (see right), a tiger also featured. See this page for more details. Ken was contracted to produce humorous cartoons for three games. Details can be seen here. The Monkey (right) can be seen on the box of the Marble Fun game by Merit.